Dense urban centers tend to be disconnected from the farms that feed them. Vincent Callebaut could change that with "Flavors Orchard," a futuristic city district designed for Kunming, China that consists of 45 energy positive villas set on a huge community orchard and food garden. The project boasts state-of-the-art sustainable technologies like automatic temperature regulation synced with the sun’s path, wind power, and a smart energy grid, and it offers residents plenty of fresh air, green space, and delicious produce. The project is based on the idea of eco-responsible lifestyles and sustainable innovations that enable biodiversity and slow down the massive rural exodus China has experienced over the last decade. Flavors Orchard is a prototype settlement that mixes all the advantages of the city and the countryside. Equipped with smart building automation systems, the villas will be connected through an intelligent power grid that redistributes the excess power harvested through photovoltaics and wind turbines. Electric vehicles will be used as buffer storage of electricity. The treatment of the site will enable integration of the masterplan and the endemic ecosystems. The villas are expected to produce more energy than they consume, thanks to passive sustainable strategies that maximize sun exposure. Heavy insulation and triple-glazed windows will reduce the need for additional cooling and heating. The villas are divided into three typologies: the Mobius Villa, the Mountain Villa and the Shell Villa. The Mobius Villa is a green-roofed, ribbon-shaped structure that contains bedrooms, bathrooms, offices, libraries and game rooms. The Mountain Villa looks like a giant Chinese fan designed to follow the sun’s path. Solarized photovoltaic glass panels are filled with algae to produce bio-hydrogen, while the building’s second exterior skin made of laminated timber works as a huge windscreen. The Shell Villa sits on six steel pillars and supports wind turbines. Shaped as a conical Chinese hat, the building offers panoramic views of the entire orchard. while there are many good points in this proposal, the author should read Jane Jacobs and the necessity of density. this project, as presented, is too much like Corbusier\'s Tower in the Park concept; a failed concept! 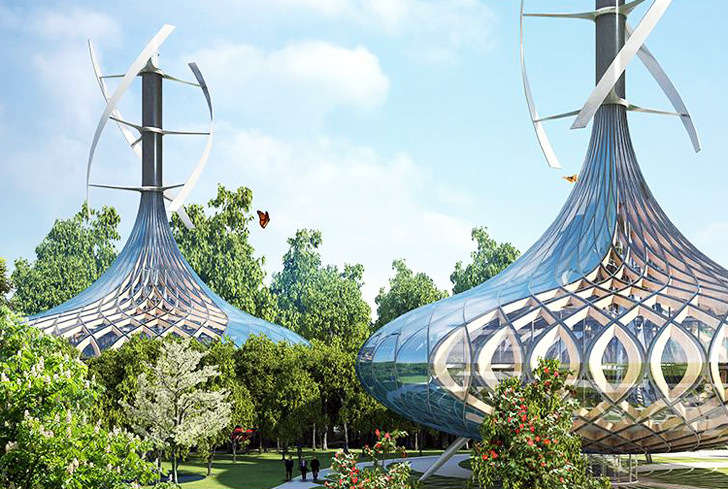 The Shell Villa sits on six steel pillars and supports wind turbines. The villas are divided into three typologies: the Mobius Villa, the Mountain Villa and the Shell Villa. The treatment of the site will enable integration of the masterplan and the endemic ecosystems. The project is based on the idea of eco-responsible lifestyles and sustainable innovations that enable biodiversity and slow down the massive rural exodus China has experienced over the last decade. Heavy insulation and triple-glazed windows will reduce the need for additional cooling and heating. Flavors Orchard is a prototype settlement that mixes all the advantages of the city and the countryside. Equipped with smart building automation systems, the villas will be connected through an intelligent power grid that redistributes the excess power harvested through photovoltaics and wind turbines. Electric vehicles will be used as buffer storage of electricity. The Mobius Villa is a green-roofed, ribbon-shaped structure that contains bedrooms, bathrooms, offices, libraries and game rooms. The villas are expected to produce more energy than they consume, thanks to passive sustainable strategies that maximize sun exposure. The Mountain Villa looks like a giant Chinese fan and it's designed to follow the sun’s path. Solarized photovoltaic glass panels are filled with algae to produce bio-hydrogen, while the building’s second exterior skin made of laminated timber works as a huge windscreen.